In the new flick The Martian, vibration testing becomes a matter of life and death, survival or starvation, when a supply probe bound for Mars and loaded with nourishment for our lonely red planet hero (Matt Damon) fails mid-launch. Prepare for movie spoilers. Left for dead and abandoned by his mission, Damon’s astronaut character attempts to farm on the inhospitable planet, rationing leftover food and dramatically losing weight while waiting for a provision refreshment launched from earth. Having undergone insufficient vibration testing in the interest of saving time, the probe then explodes mid atmospheric escape, leaving the NASA control room paralyzed. The screen cuts to the operators discussing simultaneous lateral vibration. Given the myriad of issues that could have caused the untimely explosion, it is difficult to place blame on any one singular hardware failure, miscalculation or inspection leniency. For the sake of argument, lets reference the book that inspired the movie, The Martian, by Andy Weir. Weir clues in to the fact that high G-forces were exerted on the probe’s payload of protein cubes during inspection, but the testing was done without simultaneous lateral vibration. Lateral vibration caused the cubes to liquefy during launch, their weight sloshing around within the containers. This threw the craft off balance at the last acceleration thrust, damaging bolts and allowing the payload to slam into the hull, finally resulting in tragedy. So, how could this have been prevented? Looking further into the topic of simultaneous lateral vibration, which can be approximated as the root cause, one quickly realizes it is the Achilles’ heal of the vibration industry. Simulating vibration in multiple axis directions within the laboratory environment inherits many obstacles and the industry continues to address the issue. Reproduction of a real-world environment in many cases requires a simultaneous 3-axis (X, Y, and Z axes) vibration testing system to reproduce the failure mode which the single-axis test cannot. The Sentek Dynamics’ MA-Series is the high quality solution to MIL-STD-810G, Method 527 requirements for multi-exciter (axis) testing. 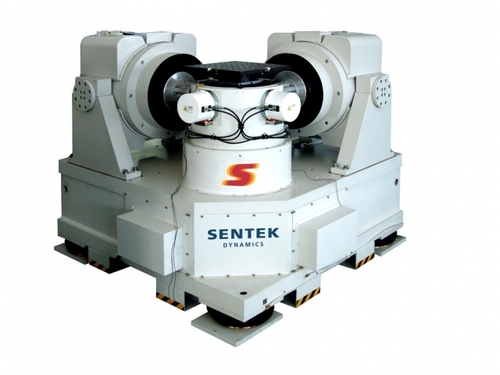 Sentek offers a complete vibration test system paired with Crystal Instruments controllers. Random Vibration Control provides precise multi-channel control in real time. The device under test is subjected to true random noise with a precisely shaped spectrum with either Gaussian or non-Gaussian amplitude statistics. With control dynamic range up to 90db, up to 512 channels can be enabled for Control, Notching, Monitoring and time data recording. “The Martian” probe launch failure, while fictional, exemplifies an important truth in the vibration testing industry: insufficient or inaccurate testing can be a multi-million dollar mistake. And while not all testing may be as high-stakes as NASA’s, surely no industry wants to risk product failure due to test negligence. To learn more about Sentek Dynamics shakers, click here. To learn more about Crystal Instruments controllers, click here. Mars "Curiosity" Rover, image credit: www.NASA.gov. This post is not endorsed by NASA. Sentek Dynamics MA-Series are the quality solution for multi-exciter (axis) testing.